The OPTIMA YellowTop is made to install and forget. No matter the conditions, be it dampness, heat, dirt or exposure to extremes in vibration or regular discharge, it is guaranteed to deliver uninterrupted power throughout the entire discharge cycle. The ability to hold a higher voltage during the discharge cycle makes it possible to utilize more of the stored power in the OPTIMA, compared to ordinary batteries. All of these benefits are due to OPTIMA’s Spiralcell® Technology, which combines the advantages of a starting battery with those of a deep cycle battery. 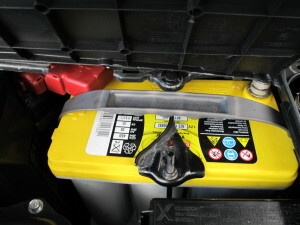 The YellowTop handles many discharges as well as re-charges without losing significant capacity and is also ideal for seasonal use because of its very low self-discharge rate. 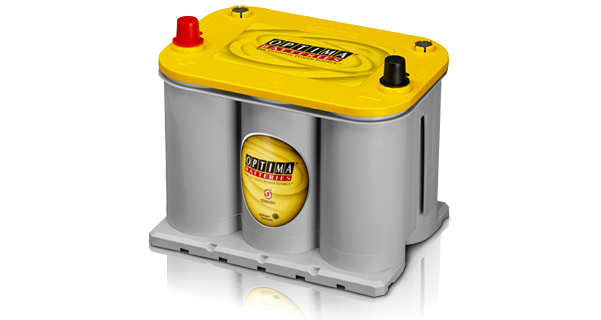 OPTIMA YellowTop batteries are made for the extremes. Whether your vehicle is designed to crank out the decibels or take the abuse of off-road driving, you need more from your battery. OPTIMA Batteries with patented Spiralcell® Technology deliver deep cycle characteristics coupled with an extreme resistance to vibration. This combination provides performance vehicles with the repetitive power they need in a spill-proof package. If your vehicle has a lot of accessories like high performance stereo/AV systems, extra lights, winches or hydraulics it demands more from its battery. 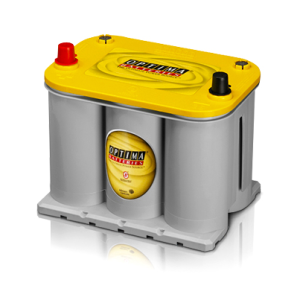 OPTIMA YellowTop batteries provide the extra performance and cycling capability that your vehicle demands. Optima Yellow Top AGM Batteries – The Ultimate in Performance, perfect for your high performance GTR or Evo that’s not your daily drive. To place you order for next day delivery please call or email us.